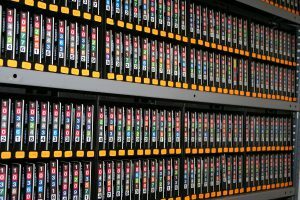 Why Do Businesses Still Use Backup Tapes? Companies rely on digital information now more than ever, and creating a strategic backup plan is essential for any company that handles critical, digitized information. There are several different types of storage devices available to organizations today. The data backup format that is particularly useful for companies requiring lots of storage space is the magnetic storage tape. Often thought of as a relic of the past, magnetic tapes actually function as a viable, and even efficient and highly secure form of data backup. The biggest value of the magnetic tape is that it can store huge amounts of data in a relatively compact format—some tapes are capable of holding several terabytes of data. This makes them the most cost effective method of data storage for large volumes of data by far. Despite the age of this technology, these benefits lead many companies to back up their important information using magnetic storage tapes. Who Uses Magnetic Tapes to Backup Data? Companies that are required to backup large amounts of data: hospitals, universities, the government, IT companies, non-profit organizations etc., can all benefit from using the magnetic storage tape rotation method. Even Google archives and backs up email information on backup tapes. Magnetic tapes are convenient, secure, and affordable, and companies across the world still rely on this technology to keep their records safe. Should Organizations Still Use Backup Tapes? A major complaint against backing up data using tapes is that it’s an outdated method and many would abandon it in favor of newer server backups. But servers can be an unpredictable and unreliable method of securing a business’s important information due to the fact that they are prone to crashing. They can also be hacked remotely, where a thief would need to break in and physically steal a magnetic tape from a secure offsite storage vault to compromise your magnetic data. To protect personal and private information, organizations and individuals alike are encouraged to routinely backup their data. Magnetic tapes have withstood the test of time and remain one of the best ways to safely backup large volumes of information. At Record Nations, we take the hassle out of finding a tape vaulting service that works for your company. We will help you find a solution, put you in touch with secure local tape rotation and storage experts, and make sure that you have the access to your backups whenever you need it. Fill out the form to the right, or give us a call at (866) 385-3706. We will connect you with up to four tape rotation and storage experts in your are who can assist you, and you can choose the best option for your needs. If you’d like to learn more about tape vaulting and tape backup, check out our related articles!